Handler sends the dog to a target 10 ft. (3 m) away where the dog must hold the first position for 5 seconds (cued or not), followed by a second cued position of the handler’s choice. Purpose: Demonstrate basic control at a distance and ability to hold positions and respond to additional cues. Exercise set-up: Handler places the dog in heel position or goes to the dog’s side. The exercise begins when the dog is given a verbal cue and/or hand signal to go 10 ft. to a target. Once at the target, the dog may maintain and hold its original position OR the handler may cue a single position of his/her choice. One optional, single cue to begin holding position (“wait”, “stay,” etc.) is allowed. The dog must hold the first position for 5 seconds. After 5 seconds, the handler will cue a second position of his/her choice. The exercise ends as soon as the dog takes the second cued position, at which point the handler may release the dog. Non-qualifiers: Dog anticipates the cue to go to the target. 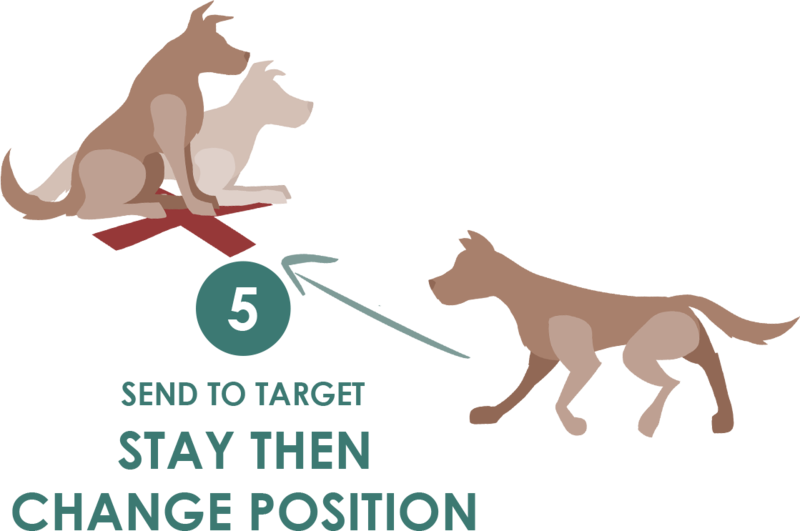 Dog does not hold first position at the target for 5 seconds, or moves before released. Dog does not perform the cued position after the 5 second stay. Handler uses multiple commands or moves after the exercise begins. Video does not permit the exercise to be adequately judged. Tips: Know your dog! Consider using your dog’s most stable position for the 5 second stay.